The national data opt-out is a significant step towards greater patient choice. It will give the public the opportunity to easily and clearly state a preference about whether their confidential patient information is used for research and planning purposes. What is the difference between using data for direct care and research or planning? When you are being seen or treated by your GP, hospital, doctor or anyone in your care team, your data is needed for your direct care to make sure you are given the right care at the right time. This is not affected and will continue as normal. Your data could also be used for research and planning purposes. This might include looking at the way care is planned in an NHS trust, or research into the causes of a disease. If you are happy that your data can be used for things outside of your direct care, including planning and research, then you don’t need to do anything. The default position being taken is that unless you choose to opt-out, your data will be used. One complication is that in that the previous NHS programme called Care.data a number of people were unhappy about the lack of transparency, and so opted out of it. If you were one of those, then your previous opt-out from Care.data will be carried forward into the new national nata opt-out. If you are unsure about whether you opted out of Care.data, your GP will be able to tell you. But it is up to you to make the choice. What if I have consented for my samples and data to be included in a biobank? If you have consented for your tissues and data to be held in a biobank and then elect to use the national data opt-out this will not apply to the biobank. If you wish to withdraw from a biobank, you will normally have to notify the biobank. The mechanism to withdraw should have been made clear to you when you originally consented. In general, if you have explicitly consented for something to happen with your samples or data, then it will continue to happen. An exception to this is if the original consent was not clear enough about how your data or samples would be used. There is no one place to go for more information about the national data opt-out. Understanding Patient Data has led some work to develop a range of accessible resources for patients and the public. use MY data members contributed to the development of a series of short animations explaining different parts of the data pathway. A recent campaign using these received over one and a half million video views. NHS Digital has also produced resources, all available online, which explain what the opt-out is and how it works. NHS digital is also responsible for securely maintaining the register of opt-outs, and providing the web-access through which you can make your choice. The ability to have a face to face conversation about this is much more difficult. The opt-out can be done now via the NHS website, call centre, or by post, and again, you can ask your GP if you previously opted out of Care.data. The Royal College of General Practitioners has recognised the support needed by the primary care community. It has developed training and information tools for those working in primary care who may need to have conversations with patients about their data. This project is called Patient Data Choices. What is use MY data? 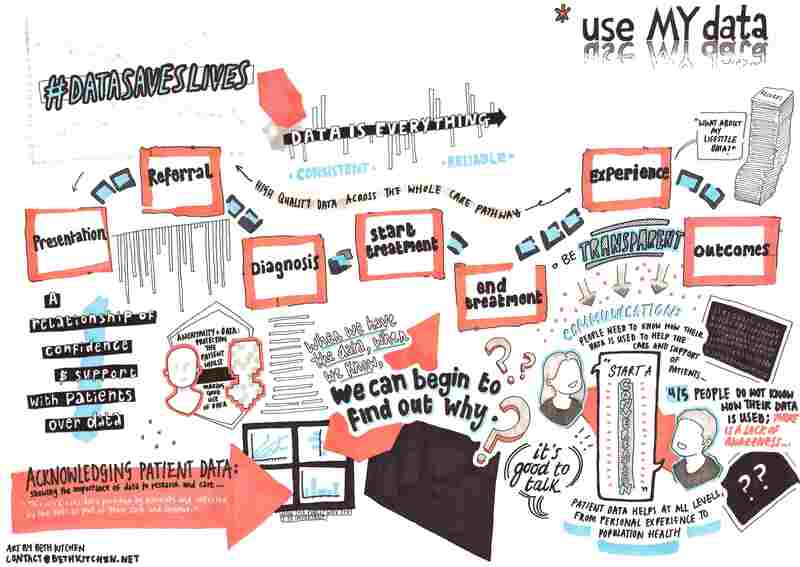 use MY data is a movement of patients, carers and relatives, with a vision of every patient willingly giving their data to help others, knowing that effective safeguards to maintain the confidentiality and anonymity of their data are applied consistently, transparently and rigorously. supports and promotes the protection of individual choice, freedom and privacy in the sharing of healthcare data to improve patient treatments and outcomes. endeavours to highlight the many benefits that appropriate usage of healthcare data can make, to save lives and improve care for all. aims to educate and harness the patient voice to understand aspirations and concerns around the use of data in healthcare delivery, in service improvement and in research, aimed at improving patient decision making, treatment and experience. What stance does use MY data take on this? As a movement of patients, relatives and carers who are keen for their data to be used, use MY data has long had an interest in the development of the new opt-out mechanism. Our members have a spectrum of views about it, but a key point underpins them; that transparency is the key. In particular is the concept of making ‘an informed choice’ and it is essential that those who choose to opt out, understand what they are opting out from. Getting information can be difficult, even for those working in the area of data research. Ideally, being informed means having a good understanding of how data is obtained, stored, managed and shared. It also includes understanding who can hold our data, and what safeguards are in place to make sure this is done safely. We believe that it is essential to look at both the benefits and the risks of using and sharing patient data. This entry was posted in Biobanking Basics and tagged data, data opt out, nhs, use MY data. Bookmark the permalink.